The Momodora series, a franchise of classically-styled Metroidvania games for the PC created and independently developed by game designer Rdein of Bombservice, finally makes its debut on the PlayStation 4 with its latest installment, Momodora: Reverie Under the Moonlight. A prequel of the original Momodora games, Reverie Under the Moonlight is set 400 years before the first Momodora game. Players take on the role of Kaho, a priestess sent to stop a curse that’s been spreading throughout the land and has reached her village. Kaho travels to the kingdom of Karst to seek an audience with the queen but she soon finds the kingdom in ruins and infested with the undead. 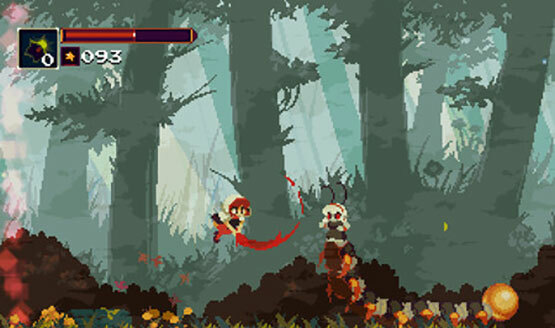 To defend herself as she explores the undead infested kingdom of Karst, Kaho brandishes a leaf from a sacred tree, the signature weapon of the Momodora series, for melee attacks and a bow for ranged attacks, which is a new addition to the series. Combat in Reverie Under the Moonlight is pretty simple and straightforward. Her leaf has a single combo chain while the bow can be charged for stronger attacks. 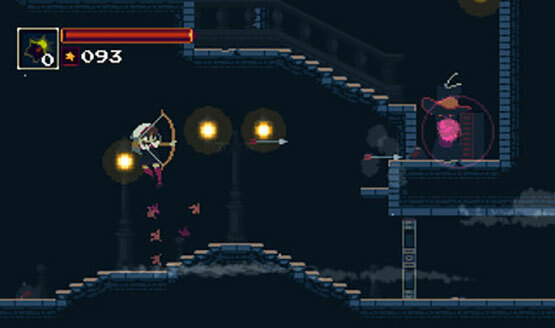 Players can roll or air dash (which is unlocked later in the game) to avoid attacks although dodging in Reverie Under the Moonlight can get quite challenging and sometimes require pixel perfect accuracy and timing. Koha can also double-jump to help her dodge and traverse the game’s levels. Enemies and breakable objects in Reverie Under the Moonlight drop crystal shards that act as the game’s currency. They can be used to purchase items from the several shopkeepers encountered throughout the game. Kaho will also be able to discover, pick up, and equip a number of active and passive items throughout the game. Active items, with a limited number of uses before needing to be recharged at save points, include ones that can restore her health, and boost her damage for a time, among others, while passive items can include ones that imbue her attacks with additional properties, increase her defense, and more. Much like other games in the Metroidvania genre, Reverie Under the Moonlight’s map is divided into several interconnected zones that players will regularly backtrack to as they discover more items that give them the ability to get to areas in previous zones that were formerly inaccessible. The zones in Reverie Under the Moonlight are all interestingly distinct, each offering their own challenges for exploration, puzzles to solve, and at least one boss fight. To keep track of areas players have already explored or areas they’ve yet to enter, the game offers a grid-like map that also shows the map completion percentage. To help with exploration, Reverie Under the Moonlight brings back the bell shrine save points from previous titles where players can save their progress, restore their health, and warp to and from other bell shrines, making backtracking to other areas much easier. Sadly, even with the hefty amount of exploration and backtracking involved in the game, Kaho’s journey through Karst is quite brief. Even completionist players will be surprised just how fast it takes to complete the game and find all its collectibles. Fans of the series will instantly notice that the visuals of Reverie Under the Moonlight are significantly different from its predecessors. The retro 8-bit 2D visuals have been replaced with more complex, detailed, and modernized pixel art. The new visuals also led to much improved animations, which are just as or even more impressive than the art. In spite its visual changes though, Reverie Under the Moonlight doesn’t lose its retro feel and instead offers a beautiful mix of classic and modern visuals. Momodora: Reverie Under the Moonlight is a pleasant and often challenging run through a fascinating world that ends much too soon. While the game doesn’t present anything innovative or bring anything new to the Metroidvania genre, it’s still quite an enjoyable albeit disappointingly short experience. From the updated visuals and animations to the platforming and combat, Reverie Under the Moonlight doesn’t fail to impress. And its interesting story and world only leads to wishing the game was a lot longer and more explored. Review code for Momodora: Reverie Under the Moonlight provided by publisher. Reviewed on PS4. For more information on scoring, please read our Review Policy here.